Most bunkers are located below ground and they have an extremely good protection in case of tornadoes, armed attacks or even bombs. While some bunkers are specially designed for military purposes, there are some that have gone from the standard military design (bunkers made for war time), to prepper design. Preppers use underground bunkers against nature rage, keep their food and water supply safe and ultimately have their family SAFE. When a house is purpose-built with a bunker, the normal location is a reinforced below-ground bathroom with fibre-reinforced plastic shells. Very important to remember, is that a bunker’s doors must be at least as strong as the walls surrounding it. If you consider building an underground bunker to survive in, for a prolong time, then you must consider a ventilation system. If you consider the underground bunker to be also BOMB SAFE, then you have to think to a structure that is very strong in compression. While the buildings around you collapse from as little as 3 psi(20kPa) of overpressure, your underground bunker need to prevent ear and internal injuries to your family inside it. You have to think hundreds psi … this decreases substantially the likelihood that a bomb can harm your underground bunker. Another thing to consider is your location. Staying in a countryside location can decrease a lot the likelihood of a bomb dropping on your shelter. Nobody will drop a very expensive bomb to destroy a single house. Building your underground bunker before making a real assessment of your potential threats is the key. During your assessment you will have to decide on what you underground bunker need to withstand. Some of these choices will be blast doors, air-filtration and ventilation equipment, secondary exits, and air-proofing. Don’t forget about the doors being at least thick as the walls. The usual design is a trap-door, to minimize the size and expense. To reduce the weight, the door is normally constructed of steel, with a fitted steel lintel and frame welded to the steel-reinforcement of the concrete. The underground shelter should be located so that there is no combustible material directly outside it. 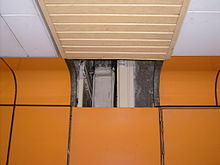 If the door is on the surface and will be exposed to the blast wave, the edge of the door is normally counter-sunk in the frame so that the blast wave or a reflection cannot lift the edge. If possible, this should be avoided, and the door built so that it is sheltered from the blast wave by other structures. The most useful construction is to build the door behind a 90°-turn in a corridor that has an exit for the overpressure. Don’t forget also a second door to the underground bunker. In case you will have the primary door blocked by debris you need a second way out. Also when you think long term use, you will need manually operated ventilators because supplies of electricity or gas are unreliable. Your underground bunker must also protect you from normal weather, including rain, summer heat and winter cold. A normal form of rainproofing is to place plastic film on the bunker’s main structure before burying it. Thick (5-mil or 125 µm), inexpensive polyethylene film serves quite well, because the overburden protects it from degradation by wind and sunlight. I hope you will build your own underground bunker for your family’s safety.